Whether it’s while working with a patient or during a casual conversation with an acquaintance, physical therapists are constantly asked about their preferences of fitness programs. For me the answer is, by far, Pilates. Whether you’re looking for something to compliment your PRI program or are just looking for a great way to get or stay in shape, it really takes the cake! 1) Focus on function and movement precision - Pilates is not a fitness approach that will buff up your “mirror muscles” like your 6 packs and biceps. It focuses on maximizing your true core muscles for stability and control of your movements. It also heavily focuses on activating target areas while quieting others that are not meant to be apart of the exercises. For instance, you do not need lower back tension while performing an arm strengthening motion. The end goal for both programs is for our participants to be able to achieve maximal core stability while performing integrated (throughout the body) movements with control. This is functional movement! 2) Focus on breath - Exercises, whether for fitness or rehabilitation, are not purposeful if you don’t breathe throughout. First of all it’s simply bad for you; It rapidly changes your blood pressure which can lead to fainting or injury. Secondly, it’s NOT functional. We breathe constantly all day long, therefore, in order for these activities to have any carryover whatsoever in our daily lives, we need to incorporate breath into the movement. 3) Focus on quieting the mind and body - Our body has a fight or flight nervous system as well as a rest and digest nervous system. Most people spend too much time in fight or flight, whether it’s because of pain, emotional stress, or type A personalities. When we get stuck in this nervous system, we are constantly “on”; Our muscles, minds, personalities become rigid and static. PRI and Pilates focus on relaxing out of fight or flight and exercising while in the rest and digest nervous system. This is not only good for stress management, it allows our bodies to turn off unnecessary muscles groups and really focusing on the target areas. 4) Emphasizing a neutral position or posture - Although the body was designed to assume many, many positions for relatively short durations of time, our modern lives tend to place us in just a few postures/positions for our entire day. Because of this, our bodies tend to develop preferences in our postures that are not healthy or balanced. The very premise of PRI and Pilates is to break out of these preferred postures and adopt a neutral position before strengthening and/or teaching our bodies to function in this optimal position. 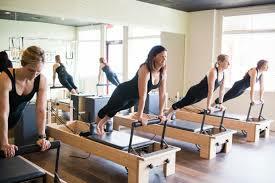 The best way to experience Pilates is by utilizing the equipment like the reformer or chair. However, if you don’t have a studio nearby or you cannot afford to attend classes at a studio, there are many great online mat work sessions! Newer PostShort Of Breath? Your Posture May Be To Blame.